Our decision to take a detour en route Manali to see the Roerich Art Gallery in Naggar was a spontaneous one. Here I encountered the worlds of Nicholas Roerich (1874-1947) for the first time. Six postcards from the Naggar museum shop would be my only connection with Roerich for many years to come. Those were pre-internet years, and our local library drew a blank vis-à-vis this painter of mountains. Today a fair representation (the entire corpus consists of nearly 7000 canvases) of Roerich’s oeuvre may be seen in online archives, but barring the occasional academic paper, there is little conversation about a being who actually deserves that overused epithet of ‘Renaissance Man’. (The apathy isn’t unique to India where Roerich spent close to thirty years creating his most inspired work; or to books written in English – in his native Russia, too, Roerich’s name has all but faded into obscurity). 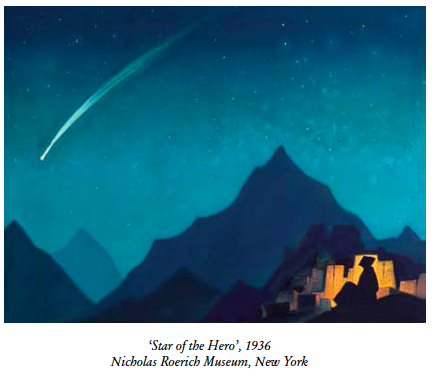 Which is why I met my review copy of ‘Nicholas Roerich: A Quest and a Legacy’ with great delight. Here is a book about an artist that isn’t a lazy coffee table number or mere biography. As editor Manju Kak observes in the introduction, ‘the average western viewer sees his work purely in the light of ‘mere’ painting without its philosophic, esoteric connotation and contextualisation’. 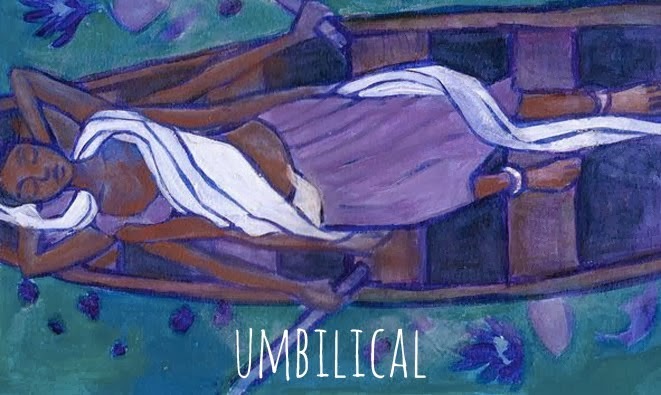 To counter this, Kak unapologetically brings together an eclectic mix of people to explore Nicholas Roerich’s spiritual, political and artistic journey. The nineteen essays are written by Indian and Western historians, Buddhist scholars, personal friends of the Roerich family, a scientist and a lama, even. To Kak’s credit, the different lenses are often far apart, even contradictory. The fulcrum of the book is Roerich’s Asia years: Nicholas and his wife Helena’s growing fascination with Theosophy, Kalachakra Tantra and the occult; their trajectory from Russia to the Himalayas; Roerich’s two Central Asian Expeditions, and the family’s settling in Himachal Pradesh until the end of Roerich’s days. The Roerich one meets in Manju Kak’s book is already nearing his forties – a successful, politically-savvy visual artist who demonstrated versatility in various fields. (He had an abiding interest in archaeology, particularly of the Stone Age; and was trained as, both, lawyer and painter). His art found patronage in government and church alike; his ambitious theatrical design (for set and costume) fired public imagination. The role theatrical design played in honing Roerich’s bold visual voice (and that of other Russian artists in the first two decades of the 20th century) is studied in Joe Troncale’s essay ‘The Transcendent as Theatre in Roerich’s Paintings’. While reading it, I was troubled by the absence of suitable accompanying illustrations. 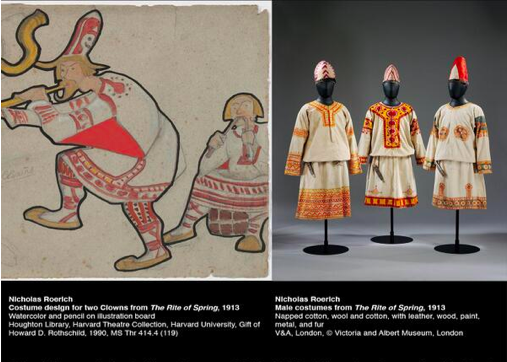 Any visual person will be forced, as I was, to run to online to see what Roerich’s designs for the legendary Ballets Russes production of ‘The Rite of Spring’ looked like (image below). As with most bonafide seekers, there were drastic changes in Roerich’s work in the course of his lifetime. The 1920s marked a particularly acute shift which corresponded with seismic changes in the artist’s spiritual landscape. It is, however, hard to see this transition from the images chosen in the book. 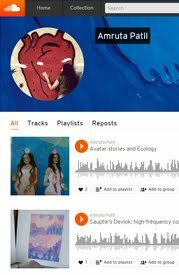 For most part, artwork seems to be randomly scattered between text, in a size that is smaller-than-satisfactory. When page-space is at premium, one grudges small things – like the black-and-white photos of Roerich being one too many; or Andrea Loseries’ essay ‘Luminosity and the Natural Mind’ having just one full-page image where one can carefully observe the minutiae being talked about. This may well be a design/layout issue; but a tighter selection process for visuals would’ve done more justice to Kak’s effort. 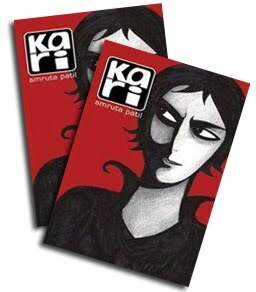 Culling some text may have allowed the inclusion of more illustrations without skewing the economics of producing this book (eminently cull-able are the essay on the Shambhala legend; at least two of the stories about the Roerich Pact; and paragraphs where authors overlap one another’s content). Another missing link is a more in-depth analysis of Nicholas and Helena Roerich’s union. Theirs was a deep spiritual partnership from the very outset – indeed it is hard to determine where the influence of Helena ends and the ideas of Nicholas Roerich begin. Roerich refered to Helena as ‘wife, friend, partner and inspirer’. She played no small role in turning her partner’s gaze eastward. Avid reader and polyglot, she was also a prolific writer and translator. Like her husband, she had a mystical bent of mind and received transmissions from Master Morya (also the spiritual guide of H.P. Blavatsky). Roerich never concealed how influential his wife was in conceiving the worlds that manifested on his canvases. It was no passive collaboration either. On a gruelling four-year trawl Roerich’s entourage made through Central Asian mountains, deserts and the wild, untouched Siberian taiga between 1924-1928, Helena was firmly by his side. The essays about the Roerichs’ expedition across Central Asia (AV Stechenko’s ‘The Central Asian Expedition’ and Ruth Drayer’s ‘Across the Gobi Desert’) were a revelation. Roerich was fifty years old when he undertook the voyage. The almost 12,000-kilometre haul was fraught with hardships, bandit attacks, imprisonment, staggering beauty and deaths of five members of the entourage because of harsh living conditions – a backdrop and plot that can only be called ‘cinematic’. Underlying reasons for their journey extended far beyond wanderlust; and details will ever remain shrouded in the secrecy occult necessitates. In ‘A Caravan in Time and Space’, LV Shaposhnikova hints at ‘laying magnets’ in places en route, at tapping into the great rhythms of the cosmos. This was a fecund time for Roerich the painter. He returned with more than five hundred paintings, an artist at the height of his powers. There was a transition from distinctively Slavic themes to Eastern overtones in style and imagery. 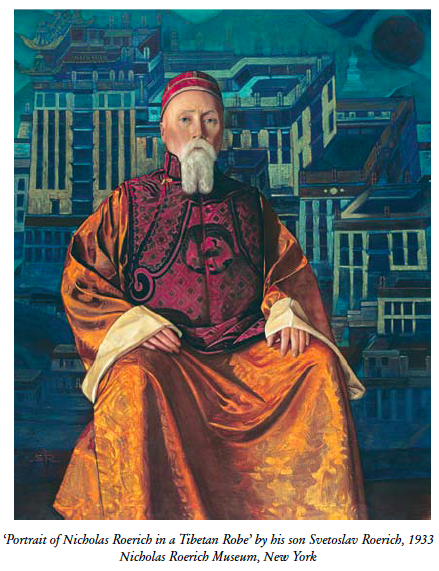 Photographs bear testament to the fact that the Nicholas Roerich who returned from kissing the hem of the Gobi desert, Altai mountains and the Himalayas was a changed man: sober, tailored European clothes give way to flowing Tibetan robes, to brocades and velvet headgear of a monarch. Roerich noted in his diary, ‘In 1924, a new era started according to Tibetan chronology.’ He had fully embraced his role as a prophet who would help usher in the new era. Scholars have suggested that Roerichs’ obsessive quest for the geographical location of Shambhala may have been inspired by the Third Panchen Lama’s The Guidebook to Shambhala. The Panchen Lama (1738-1780) made it clear that the physical journey to Shambhala could only take a seeker so far; and that the rest of journey towards that fabled realm could only be traversed by an enormous amount of spiritual practice. The journey to Shambhala was an inner quest, and Roerich did reach this understanding (sooner or later). 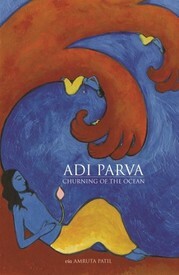 His paintings are best understood in the context of Tantric visualizations. Quoting Madhavan K. Palat in ‘Nicholas Roerich: Artist and Messiah’, “A series of canvases marked the progress through the cavern up to the mountain, the mind’s advance.” Those familiar with Tantric Buddhist imagery will recognise this as art that’s meditation-in-action, an idea elaborated upon by Chogyam Trungpa in ‘True Perception: The Path of Dharma Art’ (Shambhala, 2008). The Western world’s unease with Roerich’s work is a long-standing one. Roerich’s contemporary, the painter and critic Alexander Benois denounced his ‘endless visions’. In a cultural landscape speedily rendered anodyne by the Bolshevik rule, metaphysical themes that incessantly referred to saviours, inter-planar transmissions and energy-suffused stones generated the same unease they’d meet in skeptical, pseudo-secular settings today. Kak mentioned in a TV interview that the reason Roerich has fallen out of fashion is because contemporary art asks to be approached from a purely intellectual-conceptual angle. 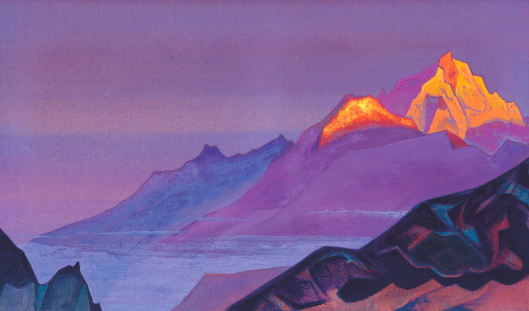 Roerich’s journey was always a spiritual rather than artistic one. Those who deign to discuss his work while refusing to engage with the convictions that underlie it will – regrettably and doubtlessly – dismiss Roerich as a painter of pretty, somewhat repetitive reveries. 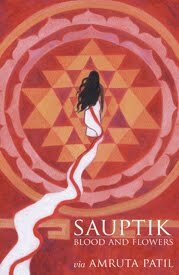 Palat notes, “Roerich looked to the inward transformation of the individual through spiritual exercises. All his art was a means to (…) a revolution through the spirit.” The paintings are completely uninterested in making small talk with a rushed spectator. Inundated as we are with reactionary art and in-your-face activist-artists, it takes a lot to understand the idea of revolutions that unfold silently. As Europe roiled through the World Wars, Roerich worked relentlessly in his mountain hermitage until the day he died, promoting ahead-of-their-time ideas like the Roerich Pact, and painting beauty. Only knowledge and only beauty, he believed, can counter ugliness. As Sina Fosdick remembers in ‘Meeting my Master’, ‘He foresaw grave calamities before they descended upon humanity…Yet he sent messages of peace all over the world, to purify the space, to help the growth of human consciousness…He scattered many benevolent milestones…’ In a world jaded by its own preoccupation with angst and underbelly; it is with unmitigated gratitude that one must celebrate an artist whose life is a tireless endeavour to hone mind, soul and hand until they cannot but create great and luminous beauty.